Due to limited vacation time and funds, my travels to exotic locations have been limited to jaunts around the United States which have included Portland, Seattle and Phoenix earlier this year. Plans later this year include New York City and San Francisco but I can’t help but to long for far-off places like my previous visits to London, Berlin and Tokyo. Although San Diego is not considered an international city the likes of Los Angeles or San Francisco — our airport has limited flights leaving to foreign locations — the city does have an international food scene. This sparked an idea. There once existed a cool restaurant two blocks from home called Parallel 33, and it featured cuisines from countries that shared the same latitude as San Diego. Unfortunately, Parallel 33 no longer exists. But the opportunity to sample the foods along the 33rd parallel north is still available — it just requires restaurant hopping and some geographic knowledge. So with a checklist in hand, an empty stomach, a few free hours and no passport needed, I embarked on this culinary trip. As with all travel, there is a departure city and San Diego was an appropriate start. Although it would be easy to start the dining adventure off with fish tacos, a less obvious choice was the California burrito, a dish — according to local legend — that was created in San Diego. 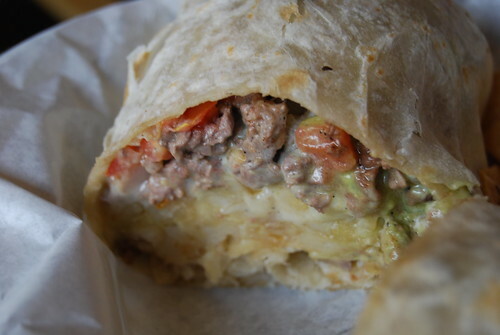 Carne asada, guacamole, cheese, salsa fresca and french fries make this burrito a favorite among San Diegans. Although every local has their favorite taco place which they claim serves the best version of the burrito, our favorite is El Zarape. Their flour tortilla is signature, and their California burrito was a mammoth meal. We should’ve taken some to go, because our journey had only barely begun! Upon starting this, Paul and had decided to tell the person seating us that we were only interested in an appetizer to share between us , mostly to avoid confusion or getting odd stares if we only ordered one thing between us and bolted after we paid. But it was to save our adventure from gastronomical disaster. The people at Hillcrest’s Kous Kous were understanding without us going into explanation of what we were doing. Morocco is a northwestern country of Africa and popular flavorings include olive oils and dried fruits. 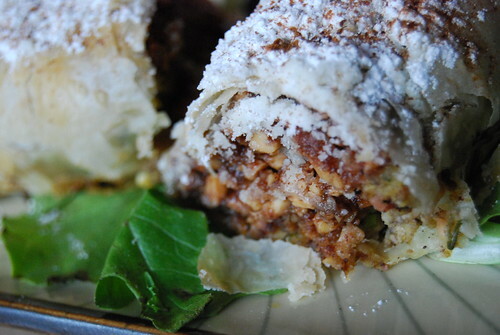 The chicken b’stilla roll at Kous Kous Cafe seemed to be an accurate representation since incorporated herb saffron chicken and almonds scented with orange blossom water and rolled into a phyllo dough with a light dusting of powered sugar and cinnamon. The chicken’s slight sweetness was a delicious accompaniment to the flaky dough and I appreciated that the orange blossom water was used sparingly and didn’t overpower the dish. Despite a dispute over lands that inhabit this part of the world, Israelis and Palestinians share many similar foods. Traditional Jewish dishes as well as dishes from Poland, Hungary, Russia are profiled in this region’s cuisine. 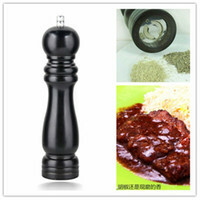 But the Mediterrean influences are the most well-known dishes in Israel. At Ramesses in Hillcrest, the owner assured us that her Palestine-born husband, who also cooks most the meals, finds the menu items to be much like what would be served in his country of birth and that we should go with their kawarma. 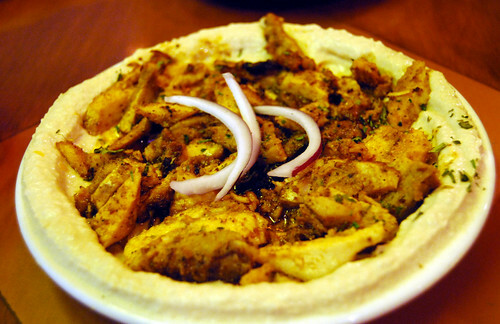 The kawarma is hummus topped with chicken shawarma and served with pita bread. Their freshly made hummus was nicely seasoned with sesame and a nice counter to the chicken. Prior to this meal, I didn’t know much about Iraqi cuisine. But looking at the menu at Ali Baba’s in El Cajon, I saw plenty of dishes with grilled meats, fava beans and flat bread, not to mention many vegetarian options. The interior at Ali Baba can be very distracting with the layers of decorative cloth, gold tassles lining the tapestries etc. but the food is a sight to behold. 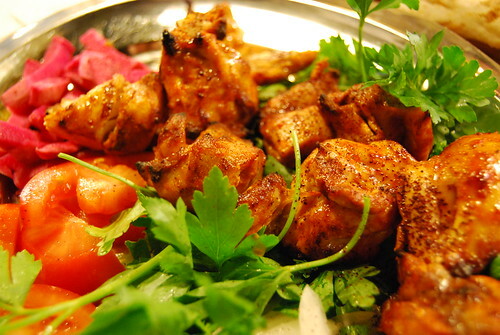 The grilled chicken tikka was accompanied with a simple salad of tomatoes, onions and beets. It’s a study in contrasts between the tender meat of the chicken, the vibrant pink from the beets and the fresh coolness from the sliced tomatoes and onions all served on a plate the color of silver. All the flavors were clean with a simple seasoning of what I suspect was sumac. It was a very hearty dish and we needed a doggy bag. I had been meaning to revisit Khyber Pass in Hillcrest many times. My first and only experience with the restaurant was before I made it a point to log my food encounters. But since the the 33rd parallel cuts through Afghanistan, it fell near the top of my list of places to visit. Afghanistan’s neighbors include Pakistan and Iran and they all have a common Middle Eastern influence. 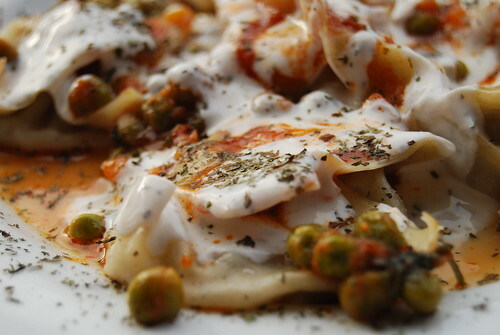 Khyber Pass’ mantu is a stuffed pasta filled with seasoned ground beef and topped with yogurt, peas, garlic and mint — reminiscent of a overly stuffed ravioli but with Middle Eastern spices. The appetizer orders come in small or large. Not taking any chances, we ordered the small but could have easily consumed a large order between us. The mantu had a subtle overlay of flavor and any heat was instantly cooled by the yogurt topping. Just as the Kashmir region is in dispute, there was also some dispute as to whether to include this country. The 33rd parallel only cuts through the northernmost part of India. Despite Paul’s past bad experiences with Indian cuisine (we suspect he’s allergic to some random spice included in most Indian dishes), I went ahead and included this nation. It seemed appropriate to order the paneer pakora — a house-made Indian cheese with a mint core, rolled in garbanzo bean flour and fried — since most of northern India includes dairy in their cuisine. 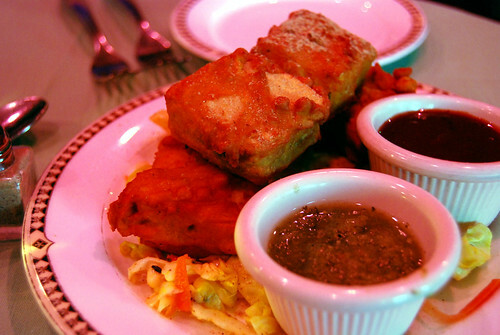 India Palace‘s cheese fritter is served with a coriander and mint chutney, both a bit on the acidic side to cut through on the richness of the cheese. The cheese was very dense but nicely seasoned. When in doubt, order cheese. After eating more than halfway around the globe, we were only then suffering the tastebud equivalent of jet lag. We should have gone the obvious route when considering Chinese food. Something like dumplings. But the crab meat cakes from China Max on Convoy St. were delicious nonetheless. Approaching 10 p.m. on this eating adventure, the waiters were understandably confused as to why we only ordered one thing on the menu and why we couldn’t finish the four moderate portions of the crab cakes. 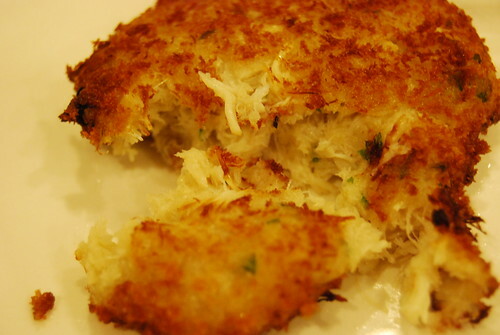 The crab cakes were fresh-made with pure lump crab meat, some seasoning and nothing else. Not a true representation of Chinese cuisine but I blame it on eating exhaustion. Our final stop on the 33rd parallel was Japan. Many foods come to mind when thinking of Japanese food but dessert seemed to be the appropriate conclusion after several hours of eating. Wa Dining Okan on Convoy St. is open until midnight and didn’t blink an eye when we only ordered dessert. I had been meaning to try Okan for several months and the innovative desserts locked in my decision to revisit Okan in the near future. Their spinach panna cotta paired with the black sesame ice cream were creamy delights. 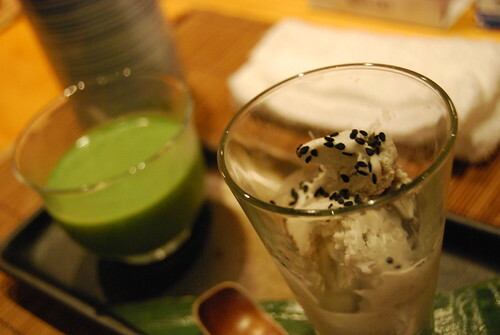 Although not “traditional” Japanese fare, both desserts were seasonly fresh — something that Okan has committed to serve. Spinach isn’t the first flavor I would’ve imagined for panna cotta but it was startlingly good. Each one of the eight restaurants I experienced offered a unique perspective of food. Even though many of the Middle-Eastern restaurants used the same spices, each had their own take. With a little imagination, planning, some research and adventurous appetite, anyone can take a culinary journey around the world without leaving the comforts of their neighborhood. But let me impart a travel tip: try to spread your journey over a couple days at the very least. This post is part of Foodbuzz’s 24×24 for the month of June which features 24 meals in 24 hours in 24 blog posts. Orange shrimp and Planet of the Apes — It’s a madhouse! Great post! I can’t believe you did this all on one day. hi darlene – awesome writeup! and great idea too! i love it! i totally remember parallel 33 – the husband and i went there for valentine’s a few years ago (pre-blogging days) and it was one of our most memorable meals. the cafeteria ladies at work would sometimes make california burritos for us. loved it! it’s what’s great about san diego! i’ve always wanted to try Kous Kous and Ali Baba…i only have a few more days left of vacation. 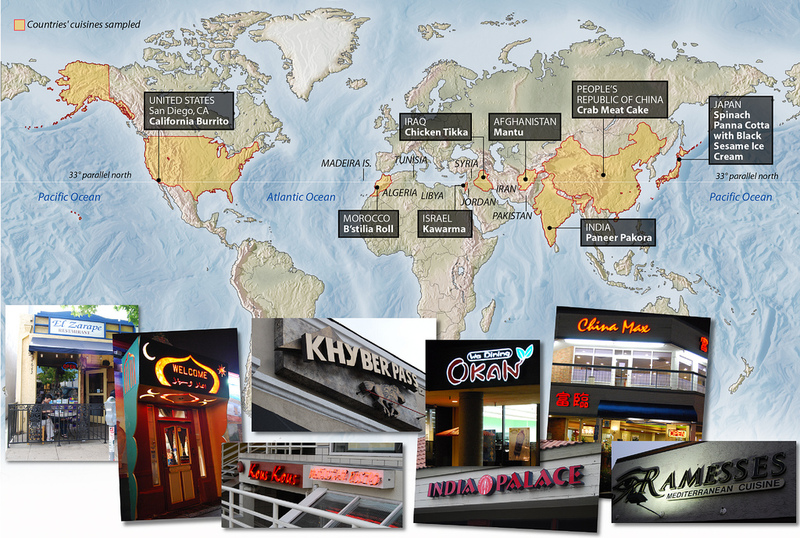 so many restaurants, so little time! Thanks! I can’t believe we did it all in one day either. I hardly remember Parallel 33 only that they had rosewater ice cream. What a great place to work at if they have California burritos. I hope you enjoy your time off until vacation is over — maybe you can try some new restaurants! Oh how fun! I haven’t tried some of these places before..more places to add to my list. Looking forward to seeing what you try and see if you discover any new restaurants. You always go to the best places. I don’t recommend it all on one day. I’m currently trying to restrict my calorie intake to make up for all the food I ate. Great site. A lot of useful information here for eating in San Diego. I’m sending it to some friends! What a great idea! Now, only if I wasn’t such a picky eater! Thanks, Jodi. I’m sure you can find something in those restaurants you would eat. What a great post- how lucky you are to have the culinary diversity without the hassle of traveling the world-no airport security, no lines, cancelled flights. Great job! I realize sometimes that I don’t appreciate the diverse food available herein San Diego. But I do love traveling too!